First of all, Midazolam belongs to a class of benzodiazepines. In addition, its component works in the brain, particularly the central nervous system. As a result, the effect will result in sleepiness, relaxed muscles, and lessen the signs of anxiety. Additionally, This drug may also lead to temporary memory loss. Presently, they prescribe the drug as anesthesia to sedate patients. It includes those about to undergo medical procedures like surgery. Additionally, doctors also give this drug to treat other conditions like treatment for anxiety under strict supervision. It is because it could cause serious breathing problems. Moreover, when these breathing problems affect a patient, this could lead to brain damage or worst death. When is Midazolam not Recommended? What to do before taking Midazolam? Furthermore, these medicines may cause adverse side effects leading to low blood pressure, respiratory problems, and intense sedation. If your doctor prescribed Midazolam, you must follow the instruction on doses found on the label strictly. In addition, you should also apply these best practices when under this prescription. Firstly, they usually administer the drug via injection. Above all, it must happen at a medical clinic or hospital. However, if you find Midazolam with particles or form of discoloration, cracked or damaged vial, don’t use it. Discard it properly. In addition, store this medicine including needles or syringe away from children and pets. No doubt, never reuse needles or syringes. You should employ proper disposal after use. In any case, if you miss a dose, call your doctor immediately. Of course, don’t hesitate to ask questions or anything that bothers you about the use of this drug. Firstly, This medicine could cause drowsiness. Therefore, Individuals taking the drug must not drive and operate machinery. Secondly, never drink alcohol or take other medications that could cause drowsiness like tranquilizers while using the drug. Thirdly, this drug could cause temporary memory loss for several hours. Fourth, if you are near old people and children, you should take Midazolam with caution. They are more prone to experience adverse side effects. Finally, pregnant and breastfeeding women must not use the drug due to the harmful effect to the fetus. Midazolam is a class of benzodiazepine drug, commonly prescribed for patients about to undergo surgery to maintain sedation. 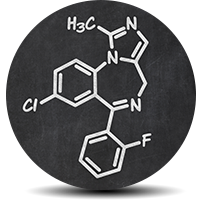 Prolonged used of Midazolam could lead to serious side effects including one’s dependence and addiction.